Poised on Collin Pehde’s desk, as if waiting for marching orders, are several lower limbs and feet produced with a three-dimensional printer. He holds one that has a satiny blue sheen and points out the ankle deformity that caused a diabetic ulcer. Pehde, D.P.M.’02, FACFAS, assistant professor in the College of Podiatric Medicine and Surgery (CPMS), treats many patients who suffer from complex foot and ankle deformities. He converts medical images of their lower limbs into files that the college’s LulzBot TAZ 3D printer transforms into fused-filament models. The medical images also can be manipulated, as in “virtual” surgery, to produce models of corrected deformities. The benefits are multi-fold. “We use the models for surgery planning, and they allow us to better educate and explain conditions and procedures to patients,” he says. “We also use them to educate students and conduct research.” In addition, he and John Bennett, D.P.M., FACFAS, use the models to discuss surgical approaches to complex cases. Pehde purchased a 3D “hobby kit” about two years ago. Then in February 2018 he attended a conference on collaborative 3D printing in medical practice held at the Mayo Clinic in Arizona. Pehde is grateful that CPMS Dean Robert Yoho, D.P.M., M.S., FACFAS, and the University’s research, accounting and information technology departments all came together to support the acquisition and set-up of the college’s 3D printer in a lab on the third floor of the DMU Clinic. “It really has been a team effort,” he says. He emphasizes that the 3D models aren’t used to diagnose conditions; rather, he makes a clinical diagnosis and uses the models to enhance and guide treatment decisions. That supports the educational mission of CPMS and its Foot and Ankle clinic. 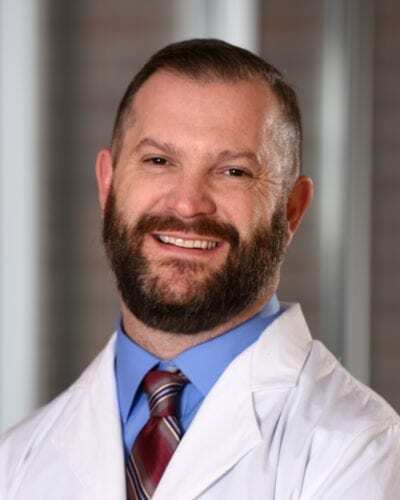 He is working with Kevin Smith, D.P.M.’95, Ph.D., FACFAS, associate dean for clinical affairs in CPMS, to study the impact of 3D printing on student learning. CPMS students Vahe Matnishian, M.S.B.S.’17, D.P.M.’20, and Brad Peck, D.P.M.’21, work two to three days a week in the 3D lab, refining their skills in using the machine. As with many technologies, it has a steep learning curve, but as recognition of its diverse applications has grown, so has accessible information about it.